Professing My Love For All Things Awesome! With today being my anniversary to my lovely bride, Elizabeth aka @SumterGatorGirl aka the Princess Bride, I found it prophetic to wax lyrical about all the things I love. How does a SQL geek, go about doing such a thing? With a table of course! Thought you should’ve been higher on the list? I can be bought, especially with SWAG! Enjoy! 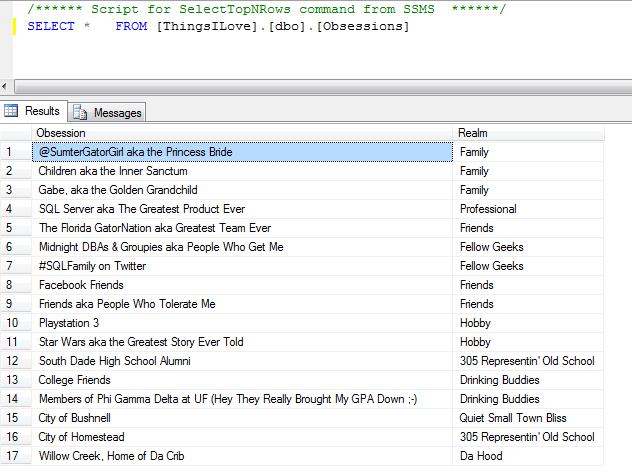 Posted on April 10, 2012, in Random Musings and tagged #SQLFamily, SQL Fun. Bookmark the permalink. 2 Comments. Never mind… after I posted that, it miraculously showed up. Nice magic trick!